If you are looking out to buy yourself one of the best electric pole saws available online, then you should not at all be fooled by the cheaper ones available. Cheap does not always mean good and there indeed is a very huge difference when the cheapest electric pole and the best electric pole out there are compared against one another. We have compiled a list of the top 5 best electric pole saws available online. The main advantage of using a telescopic pole saw is that it allows you to choose the best working height for the task. However, as a disadvantage it does tend to flex while in use. 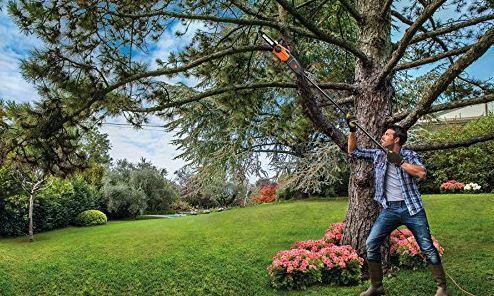 This particular telescopic pole saw manufactured by Earthwise has less of an issue when it comes to flexing when compared to most of its competitors and is powerful enough to cut down big enough branches having diameter of around eight inches. To ensure the best angle of cutting suiting different purposes, the head of this pole saw can be re-positioned. The chain system of the Earthwise Telescopic Pole saw is neat and features a self lubricating mechanism that works smoothly and perfectly. Remington is one of the best electric pole saw manufacturer out there. Their 8 AMP model is good enough to cut limbs that grow up to 15 feet tall. The inner portion of the pole saw is made of aluminum which makes the construction more strong. To improve the strength even further, the outer construction of the pole is made of fiberglass. One main advantage of the Remington Pole saw is that the head of the pole saw comes apart without any hassles and can be used in separate with any other compatible pole. The Black and Decker Pole Saw features an extension to the pole saw that helps you reach a maximum of up to 14 feet above the ground. It is powered by a 20V Li-ion battery and features an 8-inch cutter bar. You can use this pole saw to cut a maximum diameter of up to 6-inches. The Sun Joe Electric Pole saw is an ideal tool if your requirement is to cut thin logs and limbs that are overhanging. The pole of this saw extends to a maximum of 8.7ft which helps you reach up to 15ft over the head. The motor used is a 6.5AMP one and is powerful enough to cut branches that have a thickness of up to 7.5-inches. The Husqvarna Pole Saw has some neat features like an auto-switched Smart Start technology that returns the switch automatically to ON mode so as to start the pole saw easily. The cutting swath of this pole saw is 17-inches long and have detachable trimmers as well. The above mentioned are 5 of the best electric pole saws that are available online currently. If your favorite electric pole saw is missing from the above list, do leave a comment mentioning your favorite pole saw and the feature you like about it the most.